monday madruga owing to enter informe of one cas at candela in chilestraat. at once owing to despacha police y bombero p’e sitio. at arrival of the patrol owing to constata enberdad one candela n’e adres chilestraat 11, but n’e apartment behind the cas where one conocido choller live. 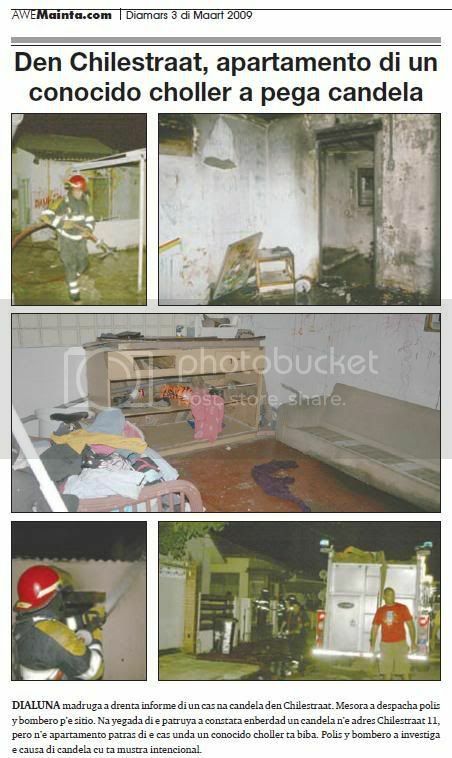 police y bombero owing to investiga the cause of candela cu is show intencional. The wave of burglaries seem to be only the RIU hotel arrangements. ORANGE CITY - Richard Velasco, general manager of RIU Palace is concerned about the bad report about the wave of burglaries in his hotel. The persistent messages on the popular review site tripadvisor.com on theft in hotel rooms of belongings that are stolen to the breaking open safes to continue his chase. "We get two to three e-mails per week. People want to know how it is with all these reports about theft in the hotel. We always send right back to their confidence, but almost never get them answer. " Many of the reviews on Trip Advisor is not correct according to Velasco. "There is nothing stolen from safes. Some of these people do it purely for money any way we can get. "Velasco said that there are fewer bookings, but do not want a direct link with the poor user reviews. It may also be to the economy, but the fact is that there is indeed less progress lately. "Exact figures can not give the Director. The case has drawn the attention of local press, Velasco is the striking that this group RIU's refusal to affiliate with Ahata more quotes. "These burglaries have nothing to do with it. But I was constantly asked why we are not affiliated with Ahata. Ahata is not about our security. It is not in the 30s as an umbrella organization which provides protection in exchange for participation. Ahata is a marketing and RIU doing its own marketing. We have so agreed. Why should politics necessarily an issue in this situation? " Velasco find that in the evening too few police on the leg to the hotels. "Between eleven o'clock at night and seven am no Visibility Team and there are only four agents in the office of North. And they must be ready for the whole hotel trip? How is this possible? "The general manager wants to do not give exact figures on the number of burglaries that took place in his hotel. "That kind of information can only lead to fewer bookings." However, he reported that the police a burglar has been arrested. Police spokesman Papito Comenencia agrees. It is known to the police that (ex-) employee of the hotel. The investigation is still ongoing but there is Comenencia no indication that it would be an 'inside job' by employees of RIU Palace. Also he reports that the hotel has been the victim of no less than fifteen incidents of burglary or theft in the last month alone. "In rooms, safes, and the beach. Everywhere. "The spokesman, however, complains about the lack of safety equipment. "There are no cameras. If there had been much less than there were burglaries, and we do our work better. "Again he Velasco's claim that there are too few agents in the area would be after eleven o'clock evening. "Look at the other hotels in the past three months, the rest of the strip but one or two burglaries had. The RIU can better first of all to himself to go look for a solution to this problem. " Rob Smith, director of Ahata is like Comenencia believe that RIU Palace itself is responsible for safety on its own site. Nevertheless, according to Smith patrouilleert the Visibility Team also, despite the fact that no member of RIU Ahata and therefore not pay for this service. "The funny thing is that last year of all high rise hotels on the strip the most an appeal on the Visibility Team. And although the night shift is small, the work provided is adequate. "According to Smith, despite the growth of crime on the island the number of incidents in the areas of hotels remained low. Smith also confirms that there have been attempts at the top of the hotel where to get to yet a member of Ahata, but that they were nothing out. "They were not in their best interest 'to participate." 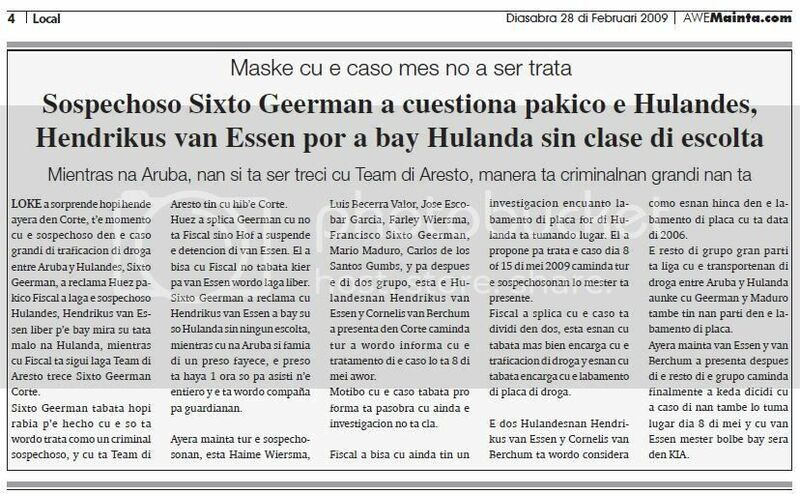 although cu the caso self not owing to being deal sospechoso sixto geerman owing to cuestiona pakico the dutch, hendrikus van essen can owing to bay the netherlands without clase of escolta while at aruba, they if is being treci cu team of aresto, as is criminalnan big they're thing owing to sorprende much person yesterday in corte, t’e instant cu the sospechoso in the caso big of traficacion of drugs among aruba y dutch, sixto geerman, owing to reclama huez pakico fiscal owing to let the sospechoso dutch, hendrikus van essen pound p’e bay see his father bad at the netherlands, while cu fiscal is follow let team of aresto trece sixto geerman corte. sixto geerman was much angry p’e mature cu the only is wordo deal because; one criminal sospechoso, y cu is team of aresto have cu hib’e corte. huez owing to splica geerman cu do not fiscal but hof owing to suspende the detencion of van essen. past owing to tell cu fiscal not was wanted for van essen wordo let pound. sixto geerman owing to reclama cu hendrikus van essen owing to bay his only the netherlands without none escolta, while cu at aruba if family of one preso fayece, the preso is achieve 1 hour only for asisti n’e burial y the is wordo compaña for guardianan. yesterday morning all the sospechosonan, esta haime wiersma, luis becerra valor, jose escobar garcia, farley wiersma, francisco sixto geerman, mario maduro, carlos de los santos gumbs, y for after the of two are, esta the hulandesnan hendrikus van essen y cornelis van berchum owing to present in corte caminda all owing to wordo informa cu the tratamento of the caso will is 8 of half now. motibo cu the caso was pro form is because cu still the investigacion do not cla. fiscal owing to tell cu still have one investigacion encuanto labamento of coin for of the netherlands is tumando lugar. past owing to propone for deal the caso day 8 or 15 of half 2009 caminda all the sospechosonan will have to is present. fiscal owing to splica cu the caso is dividi in two, esta esnan cu was more bien encarga cu the traficacion of drugs y esnan cu was encarga cu the labamento of coin of drugs. the two hulandesnan hendrikus van essen y cornelis van berchum is wordo considera because; esnan hinca in the labamento of coin cu is data of 2006. the remainder of are great part is be similar cu the transportenan of drugs among aruba y the netherlands although cu geerman y maduro also have they part in the labamento of coin. yesterday morning van essen y van berchum owing to present after of the remainder of the are caminda finalmente owing to stay dicidi cu owing to caso of they also will take lugar day 8 of half y cu van essen have to go back bay close in kia. ORANGE CITY - The court leaves one of the suspects in major drug trafficking case between Aruba and the Netherlands, without guidance to the Netherlands to visit his sick father. 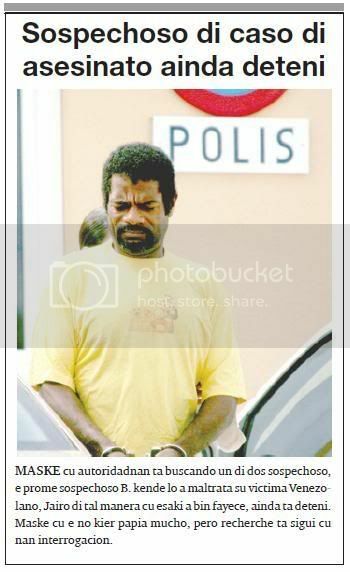 Another suspect, SG, signed here last Friday at the start of the trial to protest against. The suspect G was unfair that a co-defendant in 'freedom' could travel to the Netherlands, while he himself by an arrest team was arrested. Moreover, if he would even suspects a funeral of a relative, only an hour and then leave even accompanied by guards. The trial against the nine suspects will be on May 8, in the presence of all defendants, further proceedings. The investigation, in particular money laundering, is not yet fully completed. 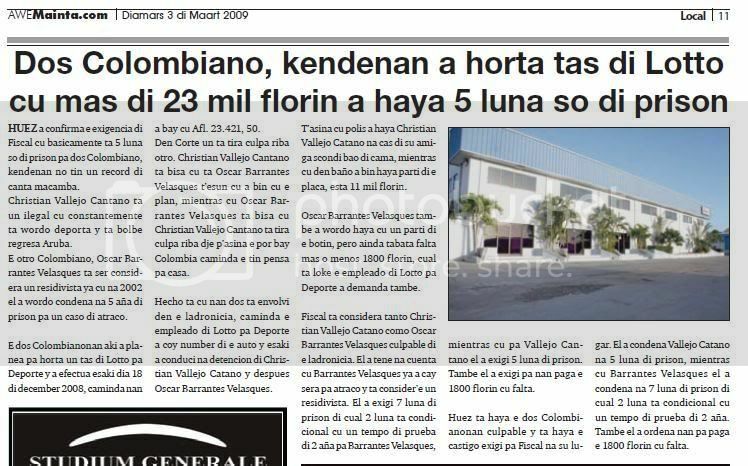 ORANGE CITY - The Colombians Oscar Barrantes Velasques and Christian Vallejo cantano, five months in jail because of the money theft of more than 23,000 florin of Lotto pa Deporte in December last year. The punishment was in line with the requirement of the Public Prosecutor (OM). The two men stole on December 18, 2008 of a geldtas Lotto pa Deporte with 23,421 florin. The registration number of their getaway car was noted by witnesses to the police the two were soon on the track. The stolen money was, after 1800 florin, the perpetrators found in the house. Cantano tried in vain to escape by the police under the bed of his girlfriend to hide. During the trial the men tried to blame each other in the shoes slide. They both stated that the other had the idea to commit theft. It emerged, however, evidence indicated the involvement of both men. In determining the appropriate penalty, held for the account of the background of both men. Valasquez few years ago was sentenced to five years in prison for a robbery and cantano has already expelled several times because he illegally stayed on the island. Valasquez was also sentenced to seven months cell, two and a probationary period of two years. Cantano was only five months jail. The men must also make up the missing amount of back pay to 1800 florin Lotto pa Deporte. 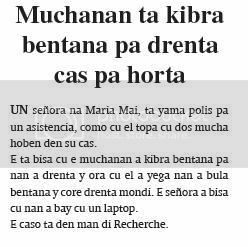 More on this story, Awe Mainta reporting that a laptop was also stolen. 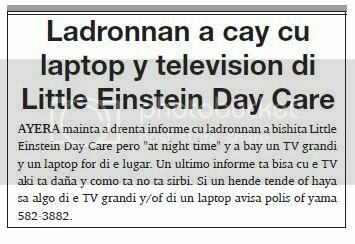 ladronnan owing to cay cu laptop y television of little einstein day care yesterday morning owing to enter informe cu ladronnan owing to visit little einstein day care but "at night time" y owing to bay one tv big y one laptop for of the lugar. one ultimo informe is tell cu the tv here is spite y because; is do not serve. if a hear or achieve know algo of the tv big y/of of one laptop avisa police or calling 582-3882.
police is bay diadomingo 4’or of madruga in ranchostraat, where will have one man throw all at blood on vlur. n’e sitio police is come across cu the victima and.r.a.j, naci at venezuela of 56 year, that had one chop serious at his cabes. ambulance owing to come n’e sitio y owing to transporte for poli for tratamento. n’e sitio, witness is tell police cu he and.r.a.j., owing to hinca one person cu cuchiu y one another person owing to maltrat’e. one rato after, police is achieve informacion cu one man owing to arrive n’e sitio cu one hinca serious. hour cu police owing to arrive owing to resulta cu t’e man j.m.w. naci at aruba of 36 year, that debi at his situation, not can owing to declara nothing. police owing to take away and.r.a.j., cas after cu past owing to wordo deal. the was much aggressive y was talk cos witch. 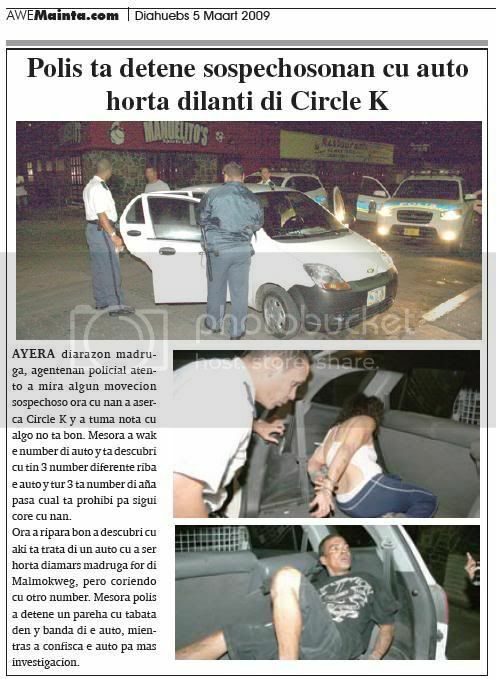 informacion cu we can owing to achieve for of vocero of police is, cu the victima is clinicamente dead. More on this story, suspect is still detained. I think it says there is more than one suspect in this case. sospechoso of caso of asesinato still deteni although cu autoridadnan is buscando one of two sospechoso, the first sospechoso b. that will owing to maltrata his victima venezolano, jairo of such as cu this owing to come fayece, still is deteni. although cu the does not talk mucho, but recherche is follow cu they interrogacion. is some day end, cu one child of 7 year, after of school, pasando in ser’i noka owing to stay sorprendi for one malhechor, that not owing to lose for earn y owing to abusa of the child here sexualmente. the parents owing to being poni at height of the susedido, the at once they owing to avisa police, y owing to happen the caso here for police of hubentud y child, for continua cu the investigacion. is dificil for in casonan so, we achieve more informacion of the mature lamentable here. is of wait for cu police can place hand on the malhechor abusador here. but if is good by this, we of awemainta for avisa parents cu have one maniaco is march rond in becindad of ser’i noka, y for they yiunan is adverti. 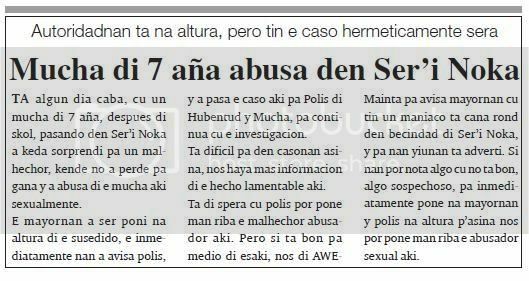 if they can notice algo cu do not good, algo sospechoso, for at once place at parents y police at height p’asina we can place hand on the abusador sexual here. This is the car that was stolen and crashed by the minors in my prior post. 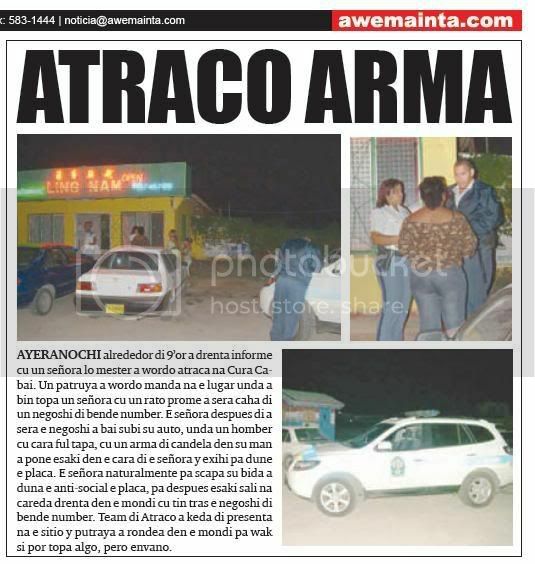 last alrededor of 9’or owing to enter informe cu one madam will have to owing to wordo atraca at cura cabai. one patrol owing to wordo send at the lugar where owing to come come across one madam cu one rato first owing to close box of one business of sell number. the madam after of owing to close the business owing to go lever his car, where one man cu cara ful tapa, cu one arm of candela in his hand owing to place this in the cara of the madam y exihi for dune the coin. the madam naturally for scapa his life owing to give the anti-social the coin, for after this leave at careda enter in the forest cu have slow the business of sell number. team of atraco owing to stay of present at the sitio y putraya owing to rondea in the forest for look at if can come across algo, but envano. while cu another detencion owing to cay yesterday ministerio publico owing to give curpa of jairo alberto ramirez jara pound for his burial as is conoci, police is bay diadomingo of carnaval, day 22 of feburary ultimo for 4’or of madruga in ranchostraat, where will have one man throw all at blood on vlur. n’e sitio police is come across cu the victima jairo alberto ramirez jara, naci at venezuela of 56 year, that had one chop serious at his cabes. ambulance owing to transporte for poli for tratamento. 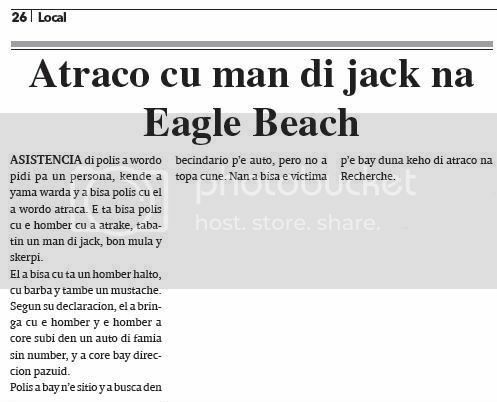 n’e sitio, witness is tell police cu the victima, esta jairo alberto ramirez jara, owing to hinca one person cu cuchiu y one another person owing to maltrat’e. at hospital, owing to constata cu the venezolano already was clinicamente dead y his monday next owing to come fayece. for of the day ey, ministerio publico owing to confisca the curpa for investigacion, while recherche had one sun sospechoso deteni. but had another sospechoso more, cu owing to tarda one some for place hand on dje. yesterday ministerio publico owing to confirma cu they owing to place hand on the another sospechoso jose coleto tromp, mihor conoci because; “be”. 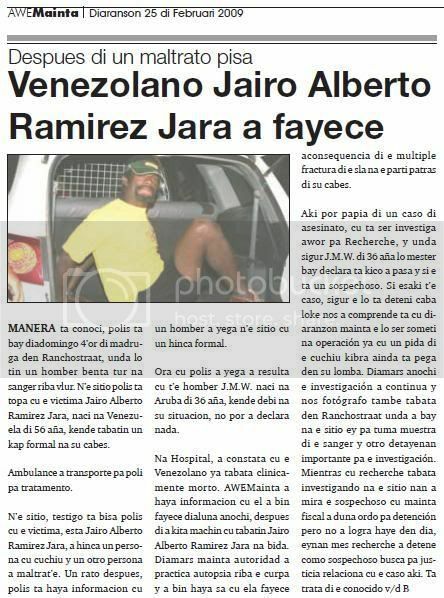 wanted mean, now have 2 sospechoso in the caso of asesinato of the venezolano here, jairo alberto ramirez jara. 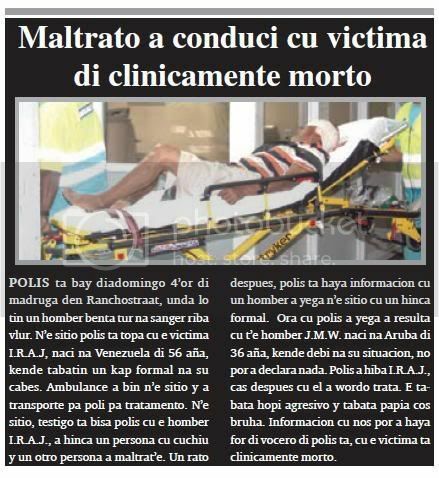 the curpa cu was confisca yesterday owing to being give pound at consul of venezuela at aruba, that will bay determina if is send the curpa venezuela or cu the burial will take lugar at aruba self. yesterday diarazon madruga, agentenan policial attentive owing to see some movecion sospechoso hour cu they owing to aserca circle k y did take notice cu algo do not good. at once owing to look at the number of car y is descubri cu have 3 number various on the car y all 3 is number of year happen cual is prohibi for follow core cu they. hour owing to ripara good owing to descubri cu here is deal of one car cu owing to being steal tuesday madruga for of malmokweg, but coriendo cu another number. at once police owing to detene one pareha cu was in y near of the car, while owing to confisca the car for more investigacion. one patrol of police bayendo for one asistencia owing to come come across cara owing to cara cu one choller canando cu one printer in his hand. at once they owing to bay atende cune. according his declaracion, a owing to dune p’e bay sell the agentenan cu not owing to confia the asunto. 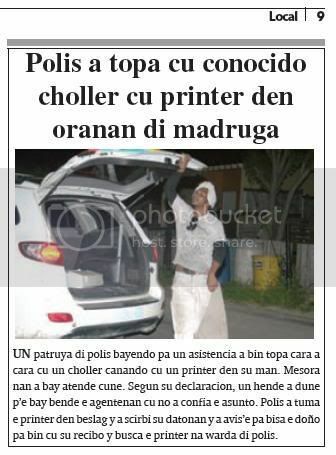 police did take the printer in beslag y owing to scirbi his datonan y owing to avis’e for tell the owner for come cu his recibo y busca the printer at keep of police. 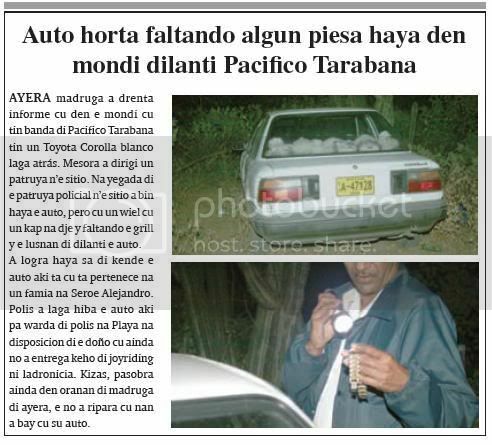 yesterday madruga owing to enter informe cu in the forest cu have near of pacifico tarabana have one toyota corolla blanco let atrás. at once owing to dirigi one patrol n’e sitio. at arrival of the patrol policial n’e sitio owing to come achieve the car, but cu one wiel cu one chop at dje y faltando the grill y the lusnan of fast the car. owing to succeed achieve know of that the car here is cu is pertenece at one family at seroe alejandro. police owing to let take away the car here for keep of police at beach at disposicion of the owner cu still not owing to entrega complaint of joyriding neither ladronicia. kizas, because still in oranan of madruga of yesterday, the not owing to ripara cu they owing to bay cu his car. asistencia of police owing to wordo ask for one person, that owing to calling keep y owing to tell police cu past owing to wordo atraca. the is tell police cu he cu owing to atrake, had one hand of jack, good mula y skerpi. past owing to tell cu is one man high, cu beard y also one mustache. according his declaracion, past owing to fight cu he y he owing to core lever in one car of family without number, y owing to core bay direccion pazuid. police owing to bay n’e sitio y owing to busca in becindario p’e car, but not owing to come across cune. they owing to tell the victima p’e bay give complaint of atraco at recherche. police of north is bay for one asistencia of ladronisia at one cas in caya emerald, tuesday 11.20 of afternoon y eynan bisiñanan is tell police cu they owing to see two young cu capucho is steal in one cas. after the testigonan owing to tell police cu the two hobennan owing to enter in one nissan sunny grey without number y owing to bay for of the sitio. according descripcion of the testigonan, uno is dress cu one t-shirt berde of carnaval, y the another cu one sweater grey cu capuchon. patrol owing to bay busca the car in becindario, y at caminda they're come across cu one trahador, that is tell they cu past owing to see the car bay direccion pazuid. police owing to bay in the direccion, but not owing to come across cu the car. police owing to bay bek n’e cas, y eynan, they're come across cu one another inhabitant, that owing to tell police cu the ladronnan owing to try steal in his cas also. one madam at maria mam, is calling police for one asistencia, because; cu past come across cu two child young in his cas. the is tell cu the children owing to break window for they owing to enter y hour cu past owing to arrive they owing to fly window y core enter forest. the madam owing to tell cu they owing to bay cu one laptop. the caso is in hand of recherche.